Numbered Folder Icons is an vast collection of handcrafted Windows Seven folders icons created with utmost attention to detail and featuring numbers on every folder image. This folder icon pack is perfect for users working with catalogs, archives and other data collections that require quick access to deeply nested folders. The Numbered Folder Icons pack consists of 421 icons. Numbers from 0 to 99, Years from 2000 to 2030 and decades from '00s to '90s. And all icons are presented in three different colors: red, green and blue, so you can not only number your folders, but also indicate its state using color. Each icon features a large number accurately inscribed into the image with pixel accuracy. This folder icon set can be used in various ways and for different purposes. For instance, you can number specific folders to demonstrate the sequence in which documents must be opened and edited, which is convenient for novices familiarizing themselves with a new workplace or students attending a particular class for the first time. Or, if you are an accountant, you can use numbered Windows 7 folder icons for months and sort documents according to their creation or modification date. If you need to rate media files or documents on a particular scale, you can use Numbered Folder Icons to create numbered folders where you will store rated documents. This folder icon pack gives you tons of file categorization and organization options to choose from. Changing the appearance of your Windows 7 folder icons is really easy with Numbered Folder Icons. Numbered folders create no additional load on the user interface of the operating system, do not consume extra RAM and do not cause any problems to the user. You are free to label any number of folders arbitrarily or in a sequence and assign numbers according to your own pattern. A great-looking set of professionally drawn folder icons, Numbered Folder Icons will be a valuable asset in the toolkit of any user working with large data archives and multiple folders that need to be located and opened as quickly as possible without using search tools. We invite those who are new to our company’s products to see our other premium product – Folder Marker Pro. Users of both Folder Marker Pro and the Numbered Folder Icons Now icon pack will receive extra benefits. 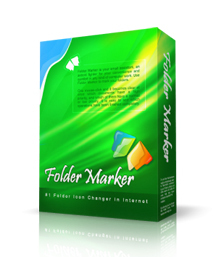 Folder Marker Pro is the #1 change folder icon solution. It offers a smart-folder highlight recipe and is the fastest way to manage the appearance of your computer. Folder views can be changed in seconds, and you can use various colors and special marks to highlight folders by priority, by information type, and many other ways. Halloween Folder Icons is a perfect addition to the standard Windows icon set – and a folder icon pack for Folder Marker adds new categories and topics to choose from!